This building was originally sited in the village of Ravensworth, 5 miles north of Richmond. 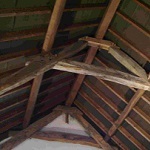 Built in the 15th century, using the timber-framed construction form of crucks, it was thought to have been the last known example to survive in the area. Plans to demolish the Cruck House in the late 1970's resulted in a stone-by-stone move to the museum. 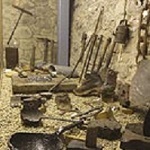 Lead Mining played a very important part in the history of Richmondshire from Roman times until the beginning of the twentieth century. The Romans used lead to make pipes, vital for the distribution of water. In the Middle Ages lead from Yorkshire was used in the construction of the magnificent cathedrals, monasteries and guild halls which were being built across the whole of the British Isles. The industry thrived once again during the Industrial Revolution and remained so until the start of the twentieth century, when it fell into decline. In the Transport Gallery at Richmondshire Museum there is a marvellous OO scale model of Richmond railway station which was constructed by Mr Malcolm Lee during the 1970s. The model depicts the station as it was in 1900. There is also an OO scale model of Easby railway bridge. These exhibits are a must for railway enthusiasts along with a three and one-half inch gauge working model of a North Eastern Railway locomotive. 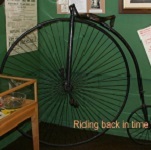 Amongst the many other items on display in the room are plans for the station, railway posters and artwork along with an original Victorian penny farthing bicycle and one-hundred year old memorabilia relating to Richmond Cyclists Meet. If you need to know the toll for travelling from Stapleton, we have the toll board for you! On display is part of the set used for the making of the film All Creatures Great & Small based on the books written by the veterinary surgeon Alf Wight. The museum obtained the set used to recreate the look and atmosphere of a 1940s Veterinary surgery when filming was complete. James Herriot (real name Alf Wight) opened this display on the 23rd May 1984, describing it as being very authentic. In a case and on the wall are several authentic pieces of farming and veterinary equipment.Most date back to an age when veterinary surgeons were few and far between and the cow or horse doctor and farmer had the responsibility of curing any animal ailments. .
Say Fenwicks and most people think of the department stores. But it is little known that the founder of this business empire was born in Richmond and started his working life in his fathers shop. 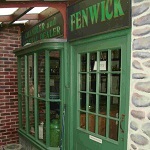 Richmondshire Museum has recreated this original shop in a small courtyard where it sits adjacent to a recreation of a Victorian Ironmonger's. Leading on from this is the Discovery Centre's based upon an oil painting, executed in 1900. It depicts life in Richmond Market place during the late nineteenth century, painted by the local artist William Sanderson. In the Discovery Centre the characters that inhabit the Market in Sanderson's painting are brought to life and convey the atmosphere of Richmond town long ago. Equipped as an interactive educational resource centre it can be used by school and community groups who have an interest in aspects of local and social history. The original oil painting by William Sanderson can be seen in our Wenham Gallery. For news of special exhibitions, events inside and outside the Museum, use the links at the top of the page to our Facebook page and Twitter Feeds where we will post all the latest information. We have mounted a special display in response to interest in archaeological finds following roadworks in the area. The display of finds from excavations at Scotch Corner and along the A66 includes a Roman Altar from Greta Bridge and a special surprise! We have put a lot of effort into electronically cataloguing and indexing our collection of artefacts and documents which we will make available for research using the Resources link above. The Museum is a registered charity and run by volunteers undertaking many and varied tasks which appeal to their personal interests. Use the link at the top of the page to find out more about volunteering opportunities; we would love to hear from you. Richmondshire Museum was founded in 1974 by the Richmond and Dales Soroptimists and opened in 1978. Since then much has been added to make the attraction a 'must' for any visitor to the town. The building appears small on the outside but is a veritable 'Tardis' once entered. 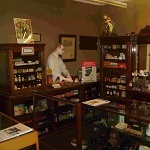 There is a wide range of items on display with the emphasis upon local and social history. 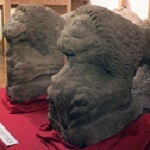 Displays include artefacts from the Stone Age to the present day.